Large Podengo: used for hunting big game. Medium Podengo: also known as Warren Hound, its natural aptitude as a rabbit hunter is well used, hunting either in a pack or alone. 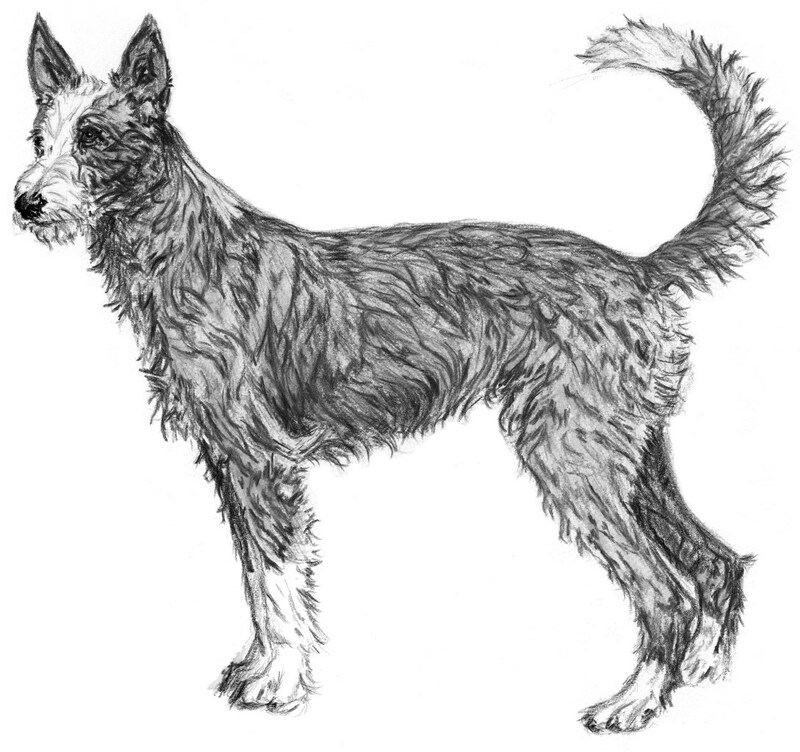 Small Podengo: used for searching rabbits in holes and rocks. : Primitive type dog, it probably originates from the ancient dogs brought by the Phoenicians and Romans to the Iberian Peninsula in the Classic Antiquity. It was subsequently influenced by the introduction of dogs accompanying the Moors in their invasions in the 8th century. It adapted to the Portuguese terrain and climate, to become what is nowadays known as the Portuguese Warren Hound. It evolved morphologically throughout the centuries due to its functionality, with the small variety being selected, from the 15th century on, as a ratter on the Caravels of the Portuguese navigators. : Quadrangular pyramidal head, with erect ears, sickle shaped tail, well proportioned, with sound construction and well muscled; very lively and intelligent; sober and rustic. It exists in three sizes, with two varieties of coat smooth and wire. Almost square (Sub-mediolinear) of large or medium substance respectively. Ratio of length of body to height at the withers 11/10 and depth of chest to height at withers 1/2. Small Podengo: Body slightly longer than high (Sub-longilinear), of small stature. The length of the body is slightly more than the height at withers with a ratio – length of body/height at the withers 6/5 and depth of chest /height at withers 1/2. : Lean and of a quadrangular pyramid shape, with large base and definite pointed muzzle. The longitudinal superior cranium-facial axes are divergent. : Flat; almost straight in profile; prominent superciliary arches; scarcely perceptible frontal furrow; the area between the ears is horizontal with prominent occipital protuberance. : Tapered and obliquely truncated, prominent at the tip; of darker colour than the coat. : Pointed; curved seen from the front, with a straight profile; shorter than the skull; broader at the base than at the tip. : Close fitting, thin; firm, horizontally cut and well pigmented. : Normal with scissors bite, with solid, white teeth; normal occlusion of both jaws. Full dentition in the large variety. : Lean and obliquely set, seen from the front. : Very lively expression; not prominent; they are small and slanted with the colour ranging from honey to brown, in accordance with the coat; lids darker than the coat colour. : Set on obliquely at the level of the eyes; straight, erect, with high mobility; vertical or tilting slightly forward, when attentive; pointed, wider at the base, triangular; thin, of considerable length, more than the width at the base. : In a harmonious transition from head to body; straight; long; well proportioned, strong and well muscled; without dewlap. : Only slightly visible in relation to the neck and back. : Straight; broad and well muscled. : Straight or slightly sloping; medium sized; broad and well muscled. : Down to the elbows; of moderate width; long, with the sternum rising back and up; ribs slightly sprung and inclined; forechest neither too apparent nor too muscled and of moderate width. : Slightly tucked up; lean belly and flanks. : Natural, set on rather higher than low; strong, thick and thinning to the tip, of medium length; at rest falls slightly curved between the buttocks down to the hocks, in action it rises horizontally either slightly curved or vertically in sickle shape, but never curled; fringed on the under side. : Upright when seen from front and sides; well muscled and lean. : Long; inclined; strong and well muscled; scapula-humerus angle, approximately 110º. : Parallel to the main line of the body. : Vertical; long and well muscled. : Lean and not prominent. : Short; strong; slightly inclined. : Rounded; long toes, strong, tight and arched; with strong and preferably dark nails, tough and firm pads. : Rounded; long toes, strong, tight and arched; short and strong nails, preferably dark; tough and firm pads. : Upright when seen from back and sides; well muscled and lean; parallel to the main body line. : Long; of medium width; well muscled. : Femur-tibia angle approximately 135º. : Inclined; long; lean, strong, well muscled. : Of medium height; lean; strong; open hock angle, approximately 135º. : Strong; short; inclined; without dewclaws. : Light trot, easy and agile movement. : Thin and tight. Mucous membranes preferably dark pigmented or always darker than the coat. : Two varieties Either short and smooth or long and wire - both of medium thickness; without undercoat. The short coat is more dense than the wire coat. In the wire variety the hair on the muzzle is longer (bearded). In the Small Podengo, the following colours are accepted but not preferred black, brown, with or without white markings or white with patches of these colours. Cranium/Muzzle: Parallel longitudinal superior cranium-facial axes. Jaws: Incorrect occlusion or badly implanted teeth; pincer bite; incomplete dentition in the large variety. Nose: Partial lack of pigmentation. Dewclaws: Their existence is not appreciated. Coat: Silky and/or with undercoat. Cranium/Muzzle: Convergent superior cranium-facial axes. 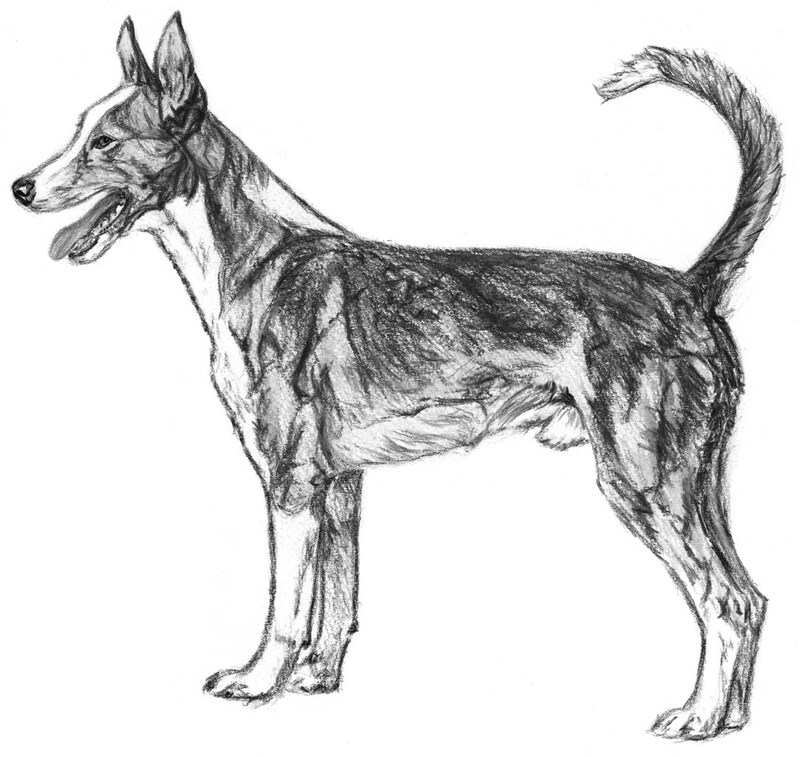 General Appearance: Signs of crossbreeding to sighthounds, pointing breeds or any other crossbreeding.